Sell in May and go away?! Many investors are familiar with the saying “Sell in May but remember be back in September.” This phenomenon, also known as the Halloween effect, states that from May to August the stock markets generally negative returns and one can better not be invested. Recent studies show that this seasonable effect is gone. Researcher Ben Jacobsen investigated 37 major capital-weighted total return index of 19 countries (in local currency). The returns from dividends were a welcome bonus. For the study period from 1970 to 1998, Jacobsen noted indeed a significant ‘Sell in May’ effect: significantly lower stock market returns from May to August and significantly higher returns in the period from September through April. A clear explanation for the “Sell in May” effect Jacobsen never found. Meanwhile, various studies show that the “Sell in May” effect is gone and certainly for more recent research periods the effect is no longer applicable. 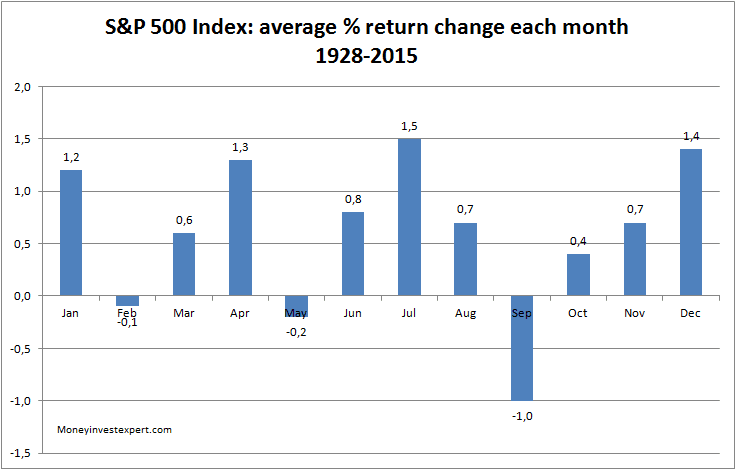 To illustrate the return per month, S & P 500 index, this shows that the months from May to August could bring a nice return. 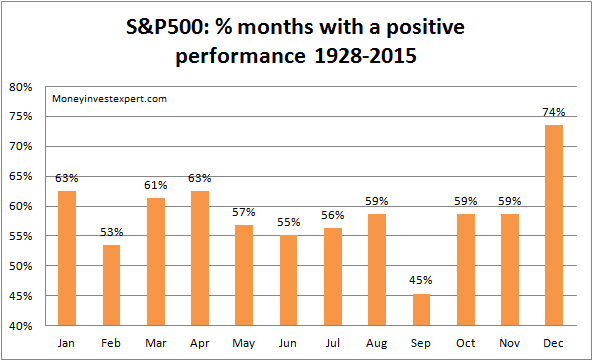 Only concern is the negative performance of September. If we have a look at the number of positive and negative months over the period 1926-2015, December is the clear winner 64 positive months and only 23 negative months (74%).